She received a rubric with the assignment and while that is good, there was no additional explanation or time to ask questions. There were no exemplars offered. The comment she received as feedback was “there isn’t enough energy here”. No explanation of how much “energy” is enough. No suggestions on how to improve the level of “energy”. The failure here was on the part of the instructor. Basically, what the instructor failed to understand is something that a good edtech coach knows: Feedback is like rain – if you want something to grow, you need to give it the right amount. This was a situation where there was not enough feedback. My friend was ready to give up. When young plants don’t get enough rain, their roots shrivel up and they die. Many times, this is what has happened when we are working with teachers who are very tech shy. Someone showed them a tech tool or laid out expectations that they learn to use some piece of equipment. They wanted to follow through and tried to. Something didn’t work and they could not figure out what went wrong…there was no follow up and without feedback to help them correct the issue, they dropped the idea altogether. After all, what teacher wants to fail in front of their students multiple times?? They might try something else if it is mandated and someone promises to help. Otherwise, when it comes to technology these folks will make any excuse not to go through that type of experience again. The opposite end of the spectrum is just as bad – too much feedback. When it rains too much, the roots of a plant either rot or slip through the mud – either way the plant falls over and dies. This is what happens when a teacher goes to a training session and returns with an overwhelming amount of materials. They try to survive the deluge, but they are unable to sift through all that information on their own. It gets compounded when the teacher receives many follow up emails “checking in” and offering additional materials. They might try the strategy on their own, but if anything goes wrong that’s it. They will never try again. It is hard to give everyone the correct amount of feedback. Teachers need different strategies depending on their learning styles and their familiarity with technology. A good edtech coach learns how to adjust their feedback to fit learning styles that aren’t like their own personal style. 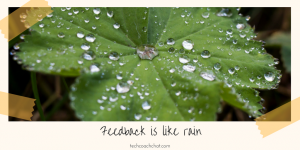 Let’s strive to make sure our feedback is just moist enough to keep our teachers growing.